OKLAHOMA CITY, OK--(Marketwired - Apr 22, 2014) - The editors of ConventionSouth magazine have tallied their votes once again, and among the winners on this year's The South's Best Meeting Site Boardrooms list is the Renaissance Oklahoma City Convention Center Hotel. The editorial team of the magazine, a national multimedia resource for planning events that are held within the South, picked 30 winners, including this hotel near Chesapeake Arena OKC, all of which are listed in this month's Business Issue of the magazine. "The April issue of ConventionSouth is focused on corporate meetings, so this is a perfect platform to showcase our Editor's Hot Picks for Best Meeting Site Boardrooms, as corporate meeting planners seek executive boardrooms for their meetings and conventions," associate publisher Marlane Bundock says. One look at this Oklahoma City hotel's meeting rooms and amenities, and it is easy to see why it made the coveted list. With more than 170,000 square feet of event space, the hotel offers the largest conference center in the state and is well-equipped to handle conventions, meetings and other functions. Its team of experts includes planners, audiovisual technicians and a full catering staff. 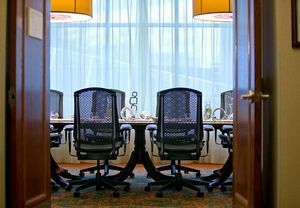 "It is with great honor we recognize these 30 stunning boardrooms located at meeting sites across the South," Bundock says, "as these rooms offer the top-notch amenities that are highly sought after by meeting planners and their attendees." A modern boutique hotel with a Southern twist, the Renaissance Oklahoma City Convention Center Hotel by Marriott offers a stylish address for those visiting for business or leisure. Located near destinations such as Bricktown Entertainment District, Chickasaw Ballpark (home of the Oklahoma City Redhawks), OKC National Memorial and Chesapeake Energy Arena (home of the Oklahoma City Thunder), this hotel is a welcome retreat at the end of a day filled with meetings or sightseeing. Guest rooms, decked in a warm, vibrant color palette, offer views of downtown, custom bedding, a desk, complimentary high-speed Internet access, an iPod dock, coffee/tea maker and room service. Visitors can also dine in the hotel's three venues, including a delicious three-course meal at 10 North Grille and freshly made baked treats at Caffeina's Marketplace. Recharge or relax with the fitness center, indoor pool and full-service spa. The hotel is a top choice for meetings, and offers 170,000 square feet of stylish event space. Renaissance Hotels encourages guests to Live Life to Discover(SM) at more than 155 hotels in 35 countries around the world, including this Oklahoma City hotel near I-35. Each hotel is unique and every stay offers an opportunity to explore local discoveries exclusive to the destination. At every hotel, Renaissance Navigators are local experts ready to assist guests in discovering local flavors and activities. Signature RLife LIVE entertainment events are designed to showcase emerging talent in music, the arts, culinary and more to inspire discovery. R.E.N. Meetings offers groups an experience beyond a traditional meeting rooted in creative sensory meeting design, RLife LIVE networking events and custom curated local Navigator excursions. At Renaissance Hotels, we work to ensure that every trip is transformed into an eye-opening, unforgettable journey. You spend your life working, you should discover the world as you go. To discover more visit www.renhotels.com. The editors of ConventionSouth magazine have tallied their votes once again, and among the winners on this year’s The South’s Best Meeting Site Boardrooms list is the Renaissance Oklahoma City Convention Center Hotel. Check out our great packages!